Thank you for looking at my Volkswagen Corrado 8V. I have owned this car since November 2018. 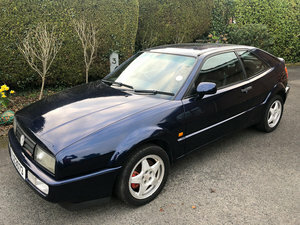 I bought it as a result of selling my 1990 16V in the summer and then having sleepless nights as a result. It has travelled 78,000 miles and has only had not failed an MoT since as far back as 2005! 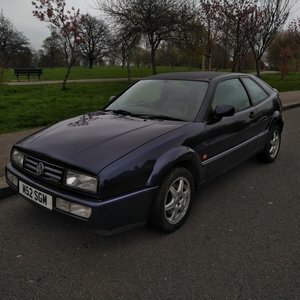 In the 5 months since I have owned this Corrado I have fitted the following: •	4 x 195/50R15 Uniroyal Rainsport 3 tyres •	Had the cam belt replaced •	New roof lining •	New BBS centre caps •	New pedal rubbers •	Leather handbrake gaiter This Corrado is quite rare insofar as it is an 8V and it is a non-sunroof model. Whilst not as lusted after as the VR6, the 2.0 8V engine is a good daily driver, which pulls like a train. I have not seen any difference in loss of performance compared with my 1.8 16V. •	The interior is unmarked and it comes fitted with the original Sony cassette/ radio. •	The exterior paintwork is finished in Diamond black metallic, which is as good as it looks in the pictures. The car has been fully resprayed and the grill, door strips and handles were all colour- coded. •	The alloys are in good condition and have been refurbished. •	The fog, front and rear lights are free of any cracks or stone chips. •	I have fitted 3M helicopter tape to protect them. •	The engine bay is spotless. •	There are no fluid leaks. •	It does have a sports exhaust and a K&N air filter. •	The underneath has had waxoyl applied where required. 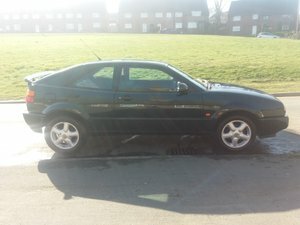 If I were to keep this Corrado then I would fully waxoyl the underneath, in order to keep it on the road for another 25 years. Having done this previously on my 16V the thought of doing the same again does not appeal! The Service book is Volkswagen/ Audi from 1995 up until 2007. It then has continued servicing at the same garage from 2008 to 2015 when it purchased by its former keeper in 2016. I have all the old MoTs along with the original PDI sheet. 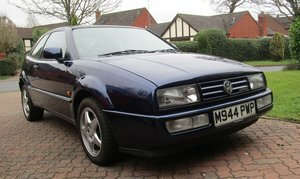 I have only put 800 miles on the Corrado since I have owned it. Please do not waste your time or mine with silly offers. £4250.00 ono No warranty is offered or implied. The car is located near to Woburn (MK17).